With so many of my quilting connections being through the internet I've never actually met many of the people that I converse with on a daily basis. In fact, I only have 2 friends who are quilters. One lives in Seattle and the other in Ohio, where we recently moved from. 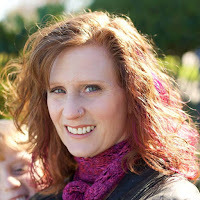 I have several quilters that I stalk keep up with through their blogs and others that are on facebook as part of the online quilt along. They are a great group of people to bounce ideas off of, share projects with, and share a cup of tea with (even if it's only one-sided while I'm catching up on the computer in the morning). I look forward to reading what they've been up to and I'm always happy when they comment on my blog or when they reply to comments I've made on their blogs. Finding virtual friendships has been a surprising aspect of blogging and the overall kindness of people I've never met has surprised me. Here is just one example of the kindness of quilters that I wanted to share. Below is a mock-up of my quilt that I'm making. 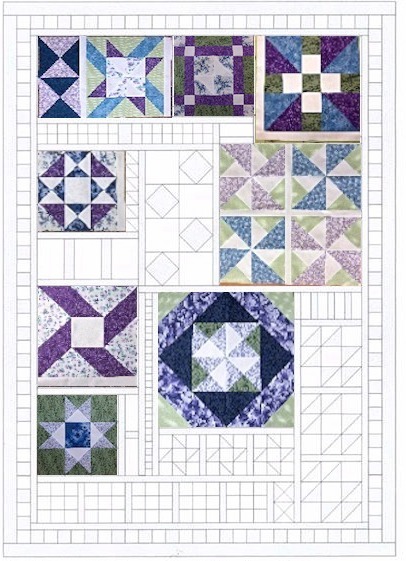 I didn't have the right software on my Mac to insert my quilt blocks into the template so I had decided to just put together a collage of my blocks to share in our QAL facebook community. Imagine my surprise when one of the other quilters, Helen from Queensland Australia, took my images and put them into the template for me! She's offered to do it for me throughout the entire QAL. How amazing is that?! It just reinforces my belief that quilters everywhere are a special lot! You should definitely check out Helen's blog - she has some great projects and she's even making 2 different accuracy quilts in the QAL, both of which are stunning.